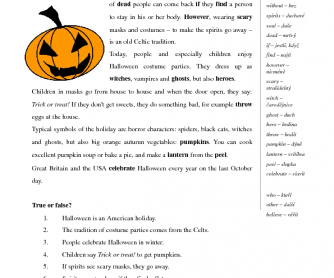 The worksheet contains a short article about Halloween and two exercises on reading comprehension. It is good for low elementary students, just present simple was used. Vocabulary is included on the right margin (Czech-English, editable). Students will learn why and how Halloween is celebrated and what the origins are.